I’ve been offline for the holidays, Bette, but had to drop by to say how beautiful this is. Thank you too for sharing traditional Christmas music. I have been lamenting the lack of it on the radio stations, even XM. Hope your Christmas was blessed and magical! Hi, Mae! Thanks so much for stopping by for a visit. I just loved this music and played in again and again while wrapping gifts and pondering the Christmas story and the reason for this Season of Joy. Our Christmas was beautiful and blessed as we bathed in the magical moments with family. May the Joy the Christmas follow you through the New Year and beyond! Blessings & love, Bette. And from Garry and I, peace, health, love, prosperity and a better year to come! Merry Christmas and Happy New Year, Bette. The best to you for 2017. 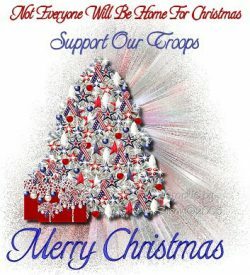 Merry Christmas, with thoughts love and prayers for our troops and their families. Merry Christmas & Happy New Year! May 2017 be serene & wonderful year for You and your family! What a beautiful tribute to this most Holy Night. How blessed we are to have the Christ child as our savior, insuring eternity, sending the Holy Spirit to give us comfort and through our prayers bring peace peace to God’s children on earth. I loved your poem and I love you. Wishing you a Holy peaceful night a Merry Christmas and Happy New Year. Thank you for sharing the music, it is wonderful.